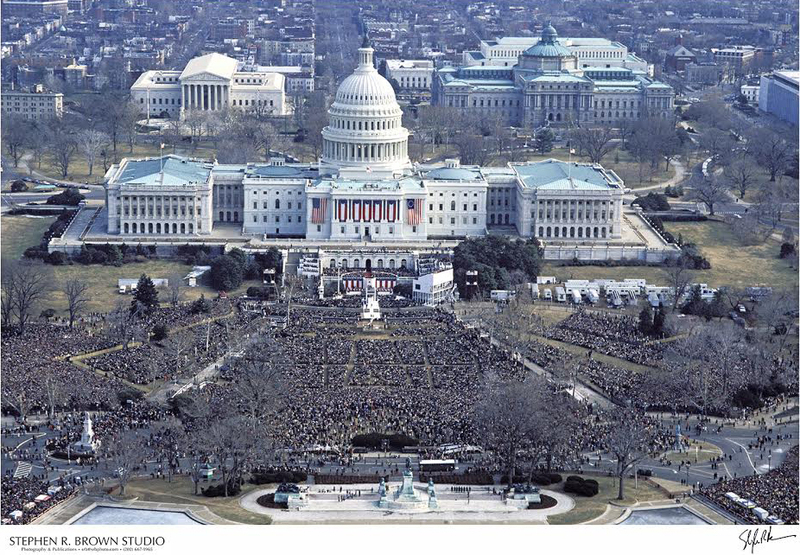 Inaugural ceremony of President Ronald Reagan photographed from a National Park Service helicopter, 1981. Stephen Brown is an award-winning photographer (Overseas Press Award and White House News Photographers-color feature award), writer, and teacher. His images and articles have appeared in Smithsonian, Life, Time, Newsweek, Fortune, The New York Times, and National Geographic Books. Portraiture subjects include Andrew Wyeth and Presidents Nixon, Carter, and Reagan. Today Stephen is also producing best-selling photobooks of his work. Stephen grew up in Brooklyn, received his BA and MA from Villanova, and has lived in Burleith for 25 years with his wife, June, and daughter Caitlin. Recently, we sat in Stephen’s backyard and talked about his 40-year career. How did you break into photography? (With this question Stephen started laughing.) I sent a well-written proposal and four slides into National Geographic, and with no formal training or work-related experience, somehow walked out with 200 rolls of film and an assignment to photograph the Tall Ships for the 1976 Bicentennial. Despite not knowing to date or caption my photos, and submitting film too late to make the story deadline, my pictures of the Tall Ships crashing into each other off Bermuda impressed director of photography Bob Gilka enough that I was hired for more freelance work. From there I worked for Life, Time, and US News and World Report (where I covered the “Siege of Beirut” in Lebanon and the U.S. Marines landing in Beirut in 1982), The New York Times, Paris Match, The Saturday Evening Post, and Fortune. Most of my career has been as a freelancer. With no formal training or experience, how did you learn the craft? I worked as a carpenter through high school and when I got out of college and, surprisingly, carpentry and photography have a lot in common, especially the importance of detailed planning. I also took courses with Fred Ward and Fred Maroon, who “taught me everything” beginning with the idea of “photographers as idea creators through to fulfillers.” I also spent a lot of time reading, studying manuals, and hanging out with other photographers trying to find out how a shot was done. And, if you don’t become a good photographer working around the photographers at Time and Life, you should be shot. But how did you become an award-winning writer and photographer? It’s really all about having the idea, then discipline and planning. I’m always surprised by the TV caricature of photographers as sort of goofy guys who happen to get the shot. I think, for me, being able to come up with great story ideas and proposals helped enormously. What were some of your hardest shots? 1) For a yacht advertisement, I suspended three cameras from the top of a 35-foot mast. I had to climb that mast twice a day for three weeks to reload film, all for one shot. 2) I wanted to get a shot of bees mating. So first I raised 200 European virgin queen bees, then I built a 40-foot scaffold in the middle of a field with a camera on top pointing up at helium balloons tied to the scaffold. After attaching the queens to the balloon strings, I spent two months shooting as the male bees arrived for the big event. Males die immediately after mating, and that was the moment I was waiting for. Day in-Day-out Work: Do you have a specialty? No. You have to do it all. How many pictures do you take a day? Now, about 100. Back in the 80s, it was more like 600. How much equipment do you carry with you? 20 to 30 pounds. What kind of camera do you use? I have eight or nine cameras and choose which is appropriate to the work. I always have an iPhone. What do you see for the future of photography? Increasingly it will become more and more conceptual, for example, remote photography using drones. Any advice for amateur photographers in the neighborhood? Good photography is really all about planning. But in addition, you get better the more you shoot. You learn from being disappointed by your pictures. So just keep clicking. Stephen's photography studio also houses his motorcycle, which is easy to park when he works on the mall and downtown. Stephen’s pictures and books can be found at http://srbphoto.com.